Cryogenic Pumps are applied to condense vapors and gases on cold surfaces in order to trap them. The freezing of the gases are largely dependent on their own boiling and freezing points relative to the temperature of the cryogenic pump. Cryogenic pumps can be used for cryotrapping wherein the residence time of molecules are increased on a cold surface without actual supercooling. Due to this feature cryogenic pumps are also known as waterpump, cryotrap or cold trap. The cooling of cryopumps are done either by built-in cryocoolers or with the help of compressed gases such as helium, hydrogen or use dry ice and liquid nitrogen. The baffles in the pump increase the surface area for condensation to take place. After the required period of condensation, the baffles surface gets saturated by condensate slowly lowering the pump speed to zero. Cryogenic pumps allow clean and fast pumping of 10-3 to 10-6 Torr range gases. Cryogenic pumps basically work on the principle that at extremely low vapor pressures, gases can be condensed and held helping in achieving high speeds and throughputs. However, not all gases can be counted to be trapped using these pumps. The major inner components of a cryogenic pump include a condensing array, a low temperature array, a thermal shield and a cold head cylinder. The advancement in cryopumping went parallel to developments in the method of liquefaction early during the 1900s. Cryogenic pumps market is anticipated to record a significant CAGR of 3.79% over the forecast period. The cryogenic pumps market is estimated to value at USD 892 million at the end of the forecast period. Moreover, the many advantageous properties of cryogenic pumps are exploited in the field of healthcare and metallurgy now and then. New uses for cryogenic pumps are discovered with increasing technological advancements which is expected to drive the cryogenic pumps market rapidly. Currently the global cryogenic pumps market is observing vibrant growth on account of increasing demand of cryopreservation in the market. Advances in healthcare industry in the past few years and growing medical explorations are projected to drive cryogenic pumps market besides the wide range of functions of cryopumping in an immense range of cryogenic pumps such as bath cryopumps, refrigerator-cooled cryopumps, and supercritical helium-cooled cryopumps during the forecast period. On the basis of regional platform, global Cryogenic Pumps market is segmented into five major regions including North America, Europe, Asia Pacific, Latin America and Middle East & Africa region. As a technologically advanced region in various end-use industries, North America is panned to observe substantial cryogenic pumps market growth due to rising cryogenic pumps usage in power generation. North America is anticipated to be followed by Asia-pacific in terms of consumption due to expanding cryogenic pumps requirements in healthcare and food industries. Due to the increasing uses of cryogenic pumps in growing end-use processes such as cryocondessation, cryosorption, cryotrapping and more, Asia Pacific is budding as a regional cryogenic pumps consumption market. The rising demand for cryogenic pumps for various processes in pharmaceutical, food, metallurgy and healthcare industries are expected to drive the market rapid over the forecast period. 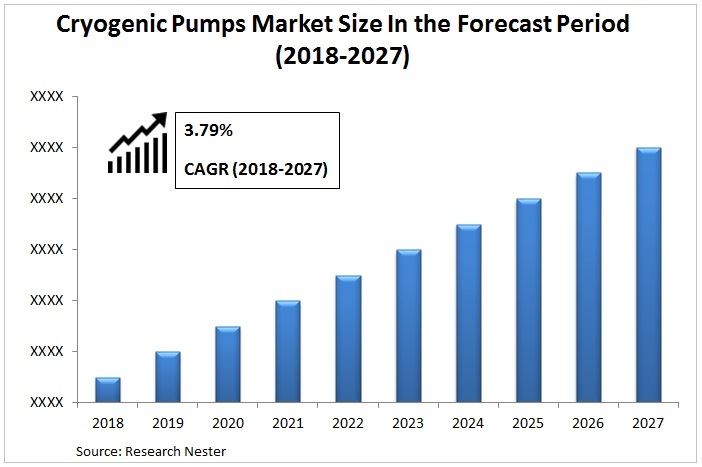 The growing R&D activity associated to applications of cryogenic pumps is further expected to increase the market growth owing to the discovery of new applications of it in expanding end-user industries. Application of cryogenic pumps lies in the cooling of magnets in superconductors, nitrogen for cooling crystals in synchrotron beamlines, sub-cooled nitrogen in cables for high temperature superconductors, argon for use in detectors on superconductors, and hydrogen in rocket propellant densification systems in electrical and electronic industries. Rapid industrialization leading to economic development with a thriving healthcare sector is expected to boost the cryogenic pumps market in the developed as well as the developing regions across the globe. However, the cost constraints as well as lack of expertise in handling these devices across the developing regions is anticipated to serve as a major restraining factor in the growth of cryogenic pumps market. Global Tech India Pvt. Ltd.